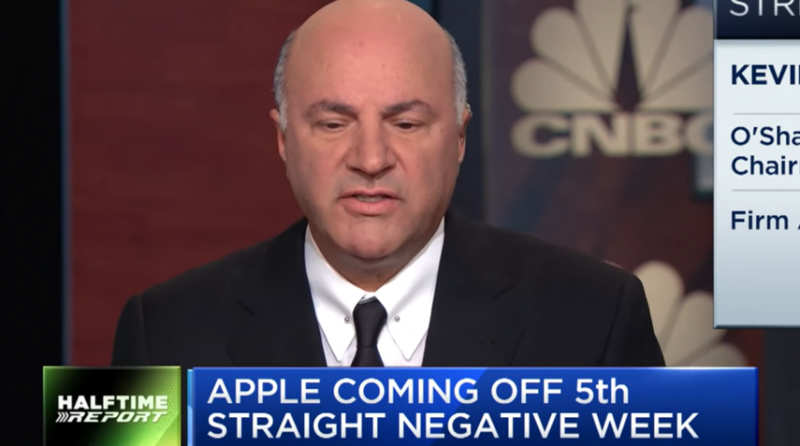 Five years ago, famed “Shark Tank” television personality Kevin O’Leary took a large bite out of tech giant Apple, but it appears his iTune has changed. The Canadian businessman told CNBC that he no longer owns the stock as a result of the company’s evolving transparency or lack thereof. “The narrative on Apple–five years ago, I got into this stock with the story that services and software subscriptions were 2% of revenue, and that they were going to bring in a whole series of innovative, what I call Trojan horses, into the market so people would buy iPads, buy laptops and buy iPhones, and slowly, buy more and more services,” O’Leary said. Last week, despite beating earnings and revenue expectations for its fourth fiscal quarter last week, murky forecasts for iPhone sales caused investment firm Rosenblatt Securities to downgrade the stock. Rosenblatt Securities, the second firm to issue a downgrade, changed their rating from “buy” to “neutral,” citing that higher iPhone prices won’t offset a weaker sales volume. However, the company also said it would no longer report how many iPhones, iPads or Macs it sells–that changed it all for O’Leary as he was listening to the earnings call. O’Leary was already wary of Apple as its shares crossed the $1 trillion market capitalization mark during the thick of the extended bull run in the summer, causing investors to board the tech giant’s titanic boat party to rejoice, but O’Leary was wary of Apple sustaining its performance given certain metrics–in particular, the stock’s high price-to-earnings ratio.